﻿ News Bharati - Let's meet the 'Yoga Masters' from China; first batch of post graduates out..! News Bharati - Let's meet the 'Yoga Masters' from China; first batch of post graduates out..! Let's meet the 'Yoga Masters' from China; first batch of post graduates out..! New Delhi, January 15: ‘Yoga is not only an ancient myth buried in oblivion but is the most valuable inheritance of the present. It is the essential need of today and the culture of tomorrow’, is the narrative which genuinely defines the significance of the art, even beyond the borders. The Indian origin of Yoga have anyway reached afar the nations, strengthening the Yogic power amidst. The neighbouring nation of China at the India-China Yoga College in collaboration with China’s Yunnan Minzu University, recently gained popularity amidst the Yoga arts. A master’s degree in yoga, offered at the China-India Yoga College, enrolled it's first students last September, and has drawn widespread attention ever since. 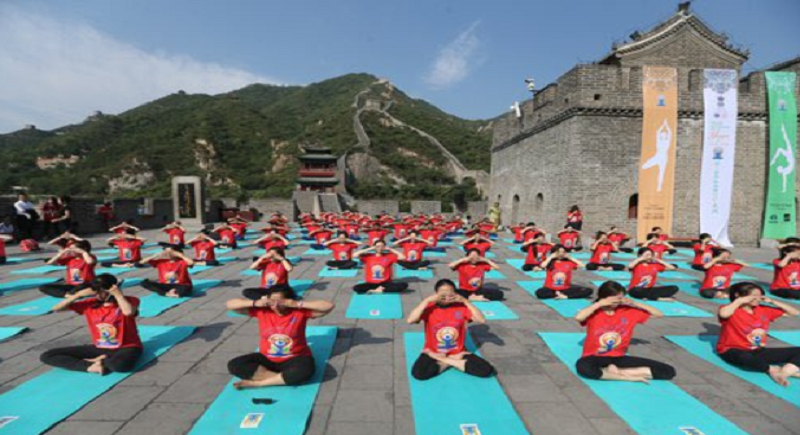 They have marked the first ever batch of postgraduate students in China to major in yoga. The students at the college, reveal the charming spirituality of the ancient practice. After 40 undergraduate students enrolled in September 2017, 12 postgraduate students registered last year. “According to the university norms, the first two academic years of the program are to be completed in China, and the final year will take place in India. In addition to professional yoga courses, the students have to study English, Indian and Sanskrit.”, said a student invading the yoga industry. “Employment is not the only aim for the students that have signed up. Yoga helped me find inner peace. It feels good to see the links between the ancient Chinese and Indian knowledge systems.”, she added. Meanwhile, Lang Gongxun, vice president of the China-India Yoga College, noted that there was huge professional demand in China’s yoga industry, and the college was hoping to train comprehensive professionals able to improve the healthy development of this sector. “China’s yoga market is still at an introductory stage that lacks systematic study and guidance, and someone must change the situation.”, Gongxun added further.